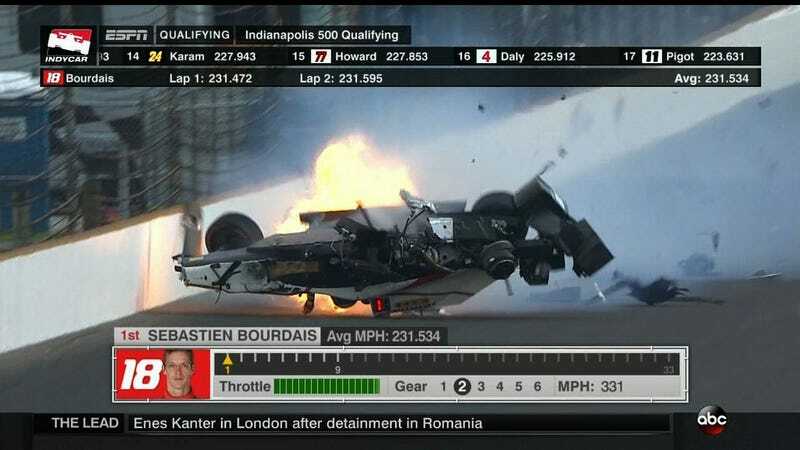 Bourdais lost control of his No. 18 car coming out of Turn 2 at Indianapolis Motor Speedway. Bourdais attempted to correct the car, but was unable to keep it from going nose-first into the wall. Bourdais has been taken away in an ambulance on a back board directly to IU Health Methodist Hospital in downtown Indianapolis for further evalution. He never lost consciousness, according to a series doctor who spoke with ABC, however, he did report pain in his lower extremities. Qualifying has been halted as crews repair the barrier. Thirteen drivers are still waiting to set qualifying times. Bourdais won the ChampCar championship four years in a row from 2004-2007, and drove for the Scuderia Toro Rosso Formula One team in 2008 and 2009. Most recently, he won the hotly contested GTLM class at the 24 Hours of Le Mans in a Ford GT. UPDATE [8:11 p.m. ET]: Bourdais will not be returning to race in this year’s Indianapolis 500. He sustained a fractured right hip and multiple fractures to his pelvis in the incident, per an update released by IndyCar. He will undergo surgery tonight at IU Health Methodist Hospital. Bourdais underwent successful surgery to repair his hip and pelvis on Saturday night and is expected to miss the rest of the season, according to a source close to Coyne’s team. He’s likely looking at 10 days in Indianapolis for recovery and rehabilitation before being flown back to his home in St. Petersburg, Fla.